Background: Postpartum is an important phase of life after childbirth. It needs to be highly important as in terms of health in future life. This time brings lots of complications with it. Lots of aspects need to be looked after as the care of the new mom is essential to bring back her stamina and strength. Objective: The objective of this review article is to explore the heeding power hidden in nature for returning back to the mothers to the pre-pregnancy state. There are various areas of concern after postpartum to heal up the body overall, such as to heal up the uterus, providing galactagogues, nutritives, maintenance of hormones and restoring back the strength and tone of the abdomen. Materials and Methods: A literature search has been done on the various herbs, which fulfill the various desired aspects to be looked after post pregnancy. Results: There are various herbs present in nature, regarding their hidden potential still the awareness is not up to the mark. This review highlights the various plants which have been proven to be useful in dealing the post-pregnancy issues. They deal with all the aspects of complications and issues occurring post pregnancy. They heal the uterus which has undergone so many types of changes, maintains the balance of hormones back, besides providing nutrition and increasing the production of milk, they also restore back the tone and strength of the walls of the abdomen. Conclusion: These herbs are full-fledged with the phytoconstituents that heal the whole system after delivery. The need of present time is to take patiently these as the source of medicines regularly under medical supervision to overcome the various concerned problems of post pregnancy. 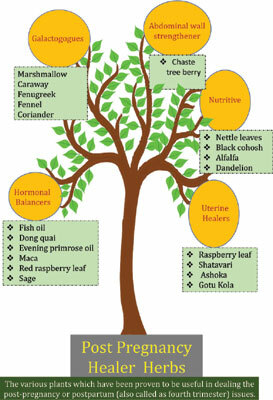 Postpartum, uterine, galactagogues, nutritive, healers, phytoconstituents.